This recipe is for a moist and delicious Paleo Zucchini Bread flavored with walnuts (optional) and cinnamon. This bread is so good my family gobbles it up as quickly as I can make it! Additionally, it freezes really well, so it would be my recommendation to make at least two loaves. It will also keep in the refrigerator for weeks, so enjoy! * Tip for removing excess water from the zucchini: Once your zucchini is shredded, you need to remove the excess liquid, and zucchini has a lot of it. What I did was place a couple paper towels down on the counter, putting the grated zucchini on top, and then placing another paper towel on top of the zucchini and squeezing until no more liquid will come out. Use more paper towels as needed, but be sure to squeeze until the zucchini feels as though there is no more water in it. Preheat oven to 350 degrees and grease either one standard or two mini bread loaf pans. Combine wet ingredients excluding zucchini in a stand mixer and beat on medium for about 2 minutes. Alternatively, combine in a large bowl and whisk together vigorously. Add zucchini and mix until combined. Pour dry ingredients into wet ingredients, add walnuts and mix until incorporated. Pour batter into a standard size loaf pan (9 x 5 x 2 1/2) or two mini loaf pans. Bake for 32-35 minutes until a toothpick comes out clean. Transfer bread out of loaf pan and cool on a wire rack. 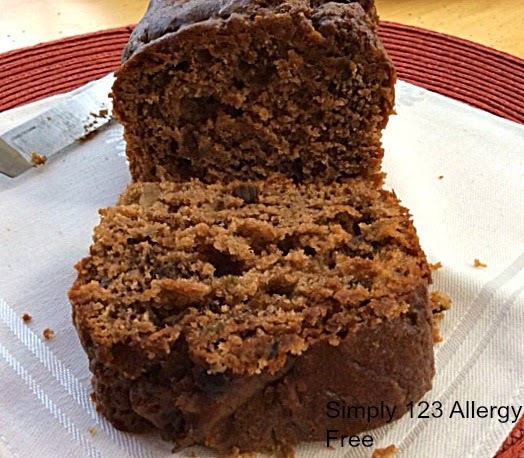 Your Paleo Zucchini Loaf looks wonderful. I like the idea of adding the walnuts too. Pinned! Thank you for sharing with us at the Hearth and Soul hop.